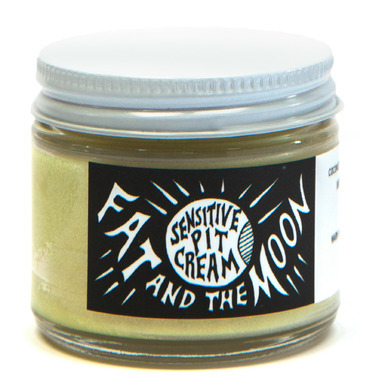 Fat and the Moon Sensitive Pit Cream is made with a little less baking soda and less essential oils. Some people just need less on their arm nooks because plants can just tickle these folks’ right into a rash. Some just love to get a whiff of the grassy scented vetiver and a green pop of basil. Directions: Put a little on the tips of your fingers and apply. A little goes a long way. I wanted to love this but it doesn't have enough staying power for me. Loved the scent and gentle to use but need a stronger deo! Love this deodorant. It works great and doesnâ€™t cause a rash. It works really well, I'm just not completely sold on the scent. One of the best natural deodorants for those that are sensitive to baking soda. Works great. Keeps you dry and odour free. Best of all it is non irritating. Love this! Works awesome, no stinky pits! Not a huge fan of the scent but it fades after a bit.